Covering more ground than Yellowstone, Yosemite, and the Grand Canyon combined, the Adirondack Park is one of the great wilderness areas in this country. 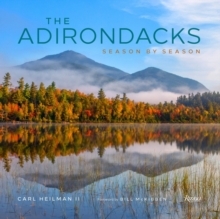 This volume presents an all-new selection of images, with a focus on how the seasons transform the landscape: the tree-covered mountains in autumnal glory, rivers hushed by winter snow, verdant meadows alive with spring, wildlife such as bears and moose, as well as historic resorts and villages. Each chapter covers a different corner of the park, from Lake Placid and the High Peaks to Saranac Lake, Lake George, and the Fulton Chain. To appreciate the wonders of the Adirondacks through the lens of one of the area s most accomplished photographers is like exploring them for the first time.